To my many endurance friends, who have suffered patiently with my gross misunderstanding of the Arabian horse, I want to publicly apologize on this web page! As the owner of two of the most gorgeous, and most personable Arabians, I have changed my mind about this breed. I still believe that the Tennessee Walker can compete just as successfully as the Arabian in the Endurance World, but I no longer see the Arabian as a hot-headed little horse. With that said (chuckle) I have found myself a new avenue in which to pursue my horse talents and skills. I am in possession of a most awesome Polish-bred Arabians and one race bred (French lines) Arabian. I will be producing one marvelous foal each year from Praire. My goals with these foals is to get them out into the Endurance World as successful competitors. A bonus would be to see one of them make it to Tevis and triumph over the most grueling 100 mile race ever mapped out. For more information on the Arabian Horse, please visit the website http://www.arabianhorses.org . For more information on the Polish Sire lines, click here. For more information on the Shalimar breeding program, click here. While I do not agree with, nor support the new “Arabian Look” which is predominant in the show ring, I still believe in the integrity of the Arabian horse breeding. My Arabians are exactly what the original breeders demanded … People oriented, calm and trusting, willing to work hard without question, compact and easy to feed, and most of all – most beautiful! 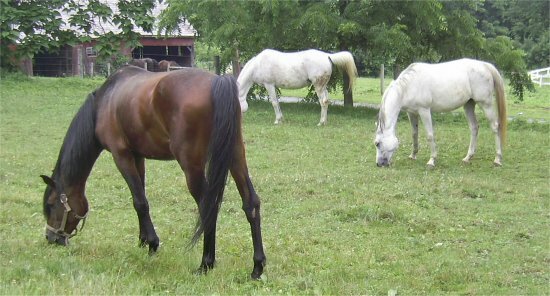 In a controversial time of economic failure within the horse industry, I have many people asking me, “Why the heck are you breeding more horses?” My goal as a small breeder is to produce one to two outstanding Arabian foals to compete in endurance. These foals will be evaluated as they mature. If they show endurance potential, they will be sold into an endurance home. If they do NOT show endurance potential, they will be sold into a home that will understand and appreciate what they ARE meant to do…be it racing, showing or family companionship. I have one well bred mare with an outstanding temperament and disposition, as well as correct conformation and intelligence, to breed to Shrapnel. I believe that I am producing exceptional Arabians. I am not interested in listening to people beat on me about bringing another horse into a world full of horses. Horses do not end up in slaughter due to the breeders…it’s rare to see a foal at the slaughter house. Horses end up in these situations because of their “current owner” and that’s all I have to say on this subject.